Your exhaust system relieves pressure created by your engine’s combustion process. The pipes draw spent gases and hot air away from the engine and dispose of them safely. This limits the stress on the internal metal components. The exhaust pipes also contain all of the poisonous vapors created by burning fuel. Repairing a leaky car muffler or exhaust manifold keeps you safe and restores the performance of your engine. Custom and aftermarket exhaust systems further reduce inefficiencies in the original design to increase the available power output from your engine. 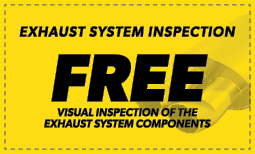 If you think your engine’s exhaust system could be improved, ask one of our technicians at our Meineke #2566 in Hagerstown, MD, to evaluate your vehicle. A common question we get is: "How often does my performance exhaust system need service?" This mostly depends on the age and mileage of your car. If your car has higher mileage or it's more than 8 years old, there is an increased probability that your exhaust system will need more frequent maintenance or repairs. If you're concerned about your exhaust system or muffler, there is no harm in getting it checked out. Contact our Meineke #2566 muffler and repair shop in Hagerstown, MD, and we can answer any questions you have regarding muffler repair cost or perform any necessart maintenance. A high-performance exhaust system for your car plays an essential role in the proper operation of the vehicle. When your car engine runs, fuel combustion naturally creates harmful gases. The performance exhaust system expels those gases from the car and keeps them from entering the interior. It also controls the emissions and amount of pollution released into the air while quieting engine sounds. It is important to fix a leak in high-performance exhaust systems as soon as it is detected because leaks can affect your car's performance. Visit your local in Hagerstown, MD, to have your exhaust system checked out. An old or damaged high performance exhaust system can decrease engine function, waste fuel and pose a health hazard for you and your passengers. There are several issues that can result in suboptimal function in performance exhaust systems for cars. For best results, consult an experienced mechanic if you are having trouble with your car muffler, your custom exhaust systems or other components. While some issues can be resolved with repairs and part replacements, others can only be addressed by installing a new performance exhaust system. To learn more about keeping your high performance exhaust functioning smoothly, visit our Meineke #2566 in Hagerstown, MD. A car muffler is a very important component of your vehicle. When it needs to be serviced or replaced, you should bring your vehicle to Meineke #2566. We know that time and muffler repair cost are important concerns, which is why our muffler shop is committed to making this a win-win situation for both you and your vehicle. 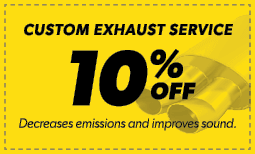 Our affordable and wide selection of high performance exhaust systems, certified, knowledgeable and professional technicians and low prices make it easy for you to get your vehicle serviced by the best performance exhaust system experts in Hagerstown, MD. Bring your vehicle into one of our many locations for a muffler inspection and performance exhaust estimate.